Join us on the Midewin National Tallgrass Prairie (MNTP) this year as we once again explore the cusp of prehistory at the Middle Grant Creek Site! 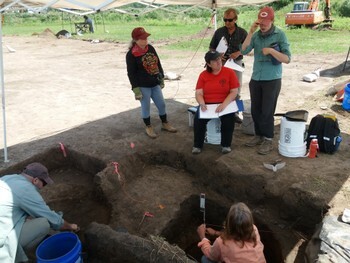 The site is an Oneota Culture (ca. A.D. 1150-1700) resource extraction and utilization site, dating to the Huber Phase (ca. A.D. 1600). We invite you to come out to the Midewin again this year as we excavate the site's deep storage pits that, so far, have yielded unique pottery, animal bones, a shell from Florida, arrowhears, and more! You will get the chance to excavate, screen, and record the site, and help us find evidence of how Huber people lived and interacted with their environment. And, since the site is only one hour from Chicago, enjoy the city and its museums, restaurants, and other attractions in your free time or on the weekends - se you this summer!